- I made a dent in the magazine stack. 3 down 2 go...til we get to the new Dec issues! - I caught up on a couple weeks worth of laundry (leaving town is a hassle sometimes, with regards to my chore schedule only!). - I cleaned house like a made woman. - I made nice with the DVR and all my trashy TV shows! - I had a great and delish dinner out with the Hubs and Mom and her fiance! Double date and it was a blast! - I only got out of PJ's ONCE, and it was divine!!!!!!! 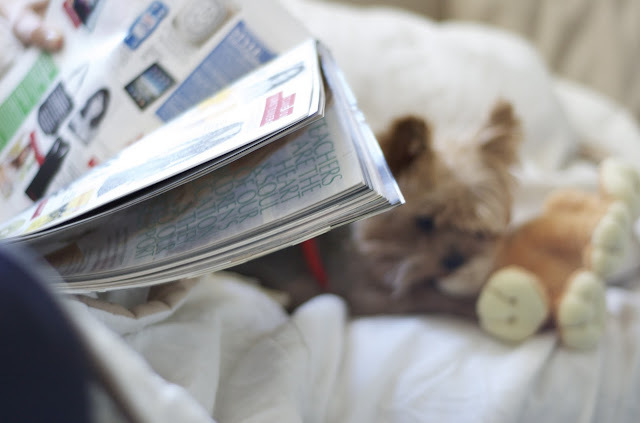 So jealous of you reading magazines this weekend! I have a large pile too but work has been crazy. But next Monday night, I am opening some wine and will start making a dent on that pile. Weekend was good, hubby and I had a great time and we had the most amazing southern meal ever. I had a few too many margaritas on Friday night and it put me under for the entire next day. I am getting old! Then I watched A LOT of My so-called Life -- gotta love it! I wish I had made a dent in my magazine stack. Sounds like an absolutely wonderful weekend! A clean house, cooking, magazines, tv-bliss! In other words, your weekend was PERFECT!!!! Your weekend sounds lovely, except for the cleaning part!!! I was able to go through my magazines to only to come up with more things for my hubby to do around the house, LOL! wow busy to say the least. I got to meet up with my best friend and shop!!! it was amazing. ha--I only got out of PJs once, too! love it!